I literally spent my whole day on these, ahahaa. I'm quite proud of these. 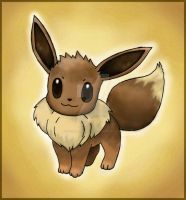 I've drawn the eevee evolutions MANY. MANY times (strangely enough I don't think I've ever uploaded them here) and I think this is the best I've done on them. These were done in watercolor, markers (mainly tombos, in which I discovered how nicely they blend with watercolor!) and a little white acrylic. And hope you all like them! cool! these are awesome! 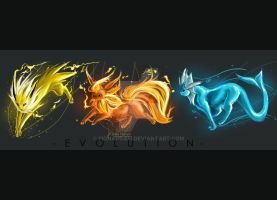 I just love eevee and his evolutions!!! You should make the rest and then show them off all together! very realistic. do you have one of espeon? Wow this is amazing. :3 I have a question for you. I find it extremely hard to use watercolors for small details. When i use them, the color goes everywhere. How do you keep the colors in a tiny little area, like the tiny little spaces of their feet? It's a matter of waiting for spots of color to dry... and lots of layering! Once you get a lot of experience using watercolor it becomes natural. And definitely use a really small brush that gives you a lot of control. Im thrilled you did only the first evs of eve! Vaperon is one of my 3 favorite pokemon! (the others are Cubone and Jirachi) This is amazing, but Vaperon is my fave! The waves are beautiful! i love Eevee, and Jolteon. I bought a cheat just so i could have decent pokemon on my pokemon pearl. wow! this is very lovely and cute. really nice work. really good and an interesting style. Oh god! This picture is true beauty in every evolution! AWESOMENESS!! you really did a great job! for some reason, i always have the toughest time drawing that one. I hope you don't mind that I posted this on my blog. I credited back to you and linked it back to this page.